You'll either need to team up with a group, stand around waiting, or do a bunch of server-hopping. As we continue our journey along Fallout 76's roadmap this month, today's patch ushered in a new questline called Lying Lowe. It seems a woman named Shelly van Lowe "...was in search of her brother, Calvin, who disappeared just before the Great War. Based on the posters she hung up, it would seem she believes the legendary "Sheepsquatch"—the fabled wooly terror of West Virginia—could be responsible." As I and a number of confused Fallout 76 players discovered, that's not quite the case. So if you reached the end of the questline and wound up standing in a cabin in the middle of nowhere, frowning at a terminal and wondering what the hell was going on—or maybe wondering why nothing was going on—you're not alone. Most of the quest involves finding clues in Lewisberg, and the crowd of players following the quest today should give you a good indication when you're on the right track. In fact, one of the first things I did at the beginning of the quest was see a secret door being opened by someone who had almost reached the end of the quest. Maybe not such a great idea to both start and end a quest in the same place in a multiplayer game, huh? Anyway, after collecting notes and reading terminal entries and searching various rooms in various buildings in a couple different cities, you learn the origins of the Sheepsquatch, you come into possession of a keycard, and you're directed to a cabin in the middle of nowhere. There's a terminal in there, and when it's your turn to use it (like I said, lots of people are completing this quest today so there's often a queue forming at the terminals), you'll see the instructions on how to summon the Sheepsquatch. Then, upon following those instructions, you're told by the terminal to basically come back later. Um. Okie dokie! I sort of thought maybe, you know, since I came all this way at the quest's urging, that maybe we could just go ahead and finish the quest right now? Rather than an unspecified time later? As it turns out, you have finished the quest! It's marked as completed in your log. Congratulations! It's just over, in the biggest anticlimax since Y2K. Where's the damn Sheepsquatch, then? Thing is, the actual Sheepsquatch isn't part of the quest, it's part of a new event. 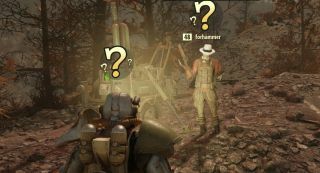 Events in Fallout 76, as you know, are designed for groups. If you're not already in a group, you might not be able to summon the Sheepsquatch at all, ever, as I and at least six or eight other players I saw poking around the cabin on different servers at different times were slowly finding out as we made question mark emotes at each other. Even on Twitch, I saw players sort of hanging around the cabin, wondering how to kick this thing off. So, if you really do want to see the 'Squatch, join up with a group, either before you get to the cabin or with whoever you find there. Or, you could just hang around the cabin waiting for a group to show up and start the event for you. Or you could server hop about nine or ten times until you find a group already in the midst of the event, which is how I wound up finally seeing the Sheepsquatch. And also how I wound up dying to the Sheepsquatch. It's very mean. It's also pretty much the toughest monster to grace Fallout 76 yet, so you definitely wouldn't want to face it on your own anyway. It just would have been nice to know that before I spent so much time hanging around a cabin wondering why a terminal wasn't letting me finish a quest I'd already unknowingly finished.